I do not think 3-D printing will one day become a repetitive focus strategy or product focus strategy because if 3-D printing used in hospitals, I would say each patients may need different design of medical 3-D printing so it should be still Process Focus Strategy because if 3-D printing become Repetitive or Product Focus Strategy, it will be just like a common product so there is be no different between common products and products with 3-D printing. I heard about 3-D printing last year, but I had no idea it was possible to use it for such purposes. It may surprise you that there are already 3-D printer models that are already on the market. Some of them only cost a few hundred dollars and are capable of producing a variety of small, simple objects. I believe these printers were designed with a process focus in mind. They are designed for quality over quantity. You enter the specifications into a program and it prints it out perfectly. I don’t think they will shift into a product focus because of the amount of time it takes for production. I have heard about 3-D printing, but I am surprised that it can also create artificial human parts. 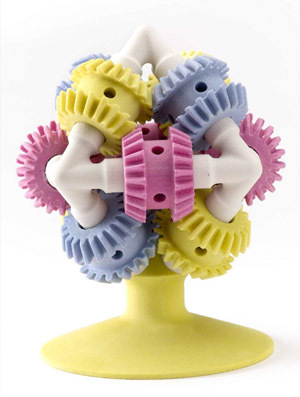 The current 3-D printing capability is definitely a process focus strategy for now, because a product can be customized and is made individually. In the future, there is a possibility for 3-D to be mass produced and become repetitive focus strategy. Mass producing would have a higher chance of lowering the quality. I think 3-D printing can help with the efficiency and quality of products if they are individuality made. I’ve heard about 3-D printing from a couple of my classes and I remember one of the videos we watched discussed the use of this technology in the medical field. However, I did not know that it would happen this fast. This technology will help us greatly in medical field. I think in the long term, 3-D printing will become the best invention because it will shorten production time and be able to save lives. I think if 3-D printing can effectively put out quality products and help peoples lives dramatically, there will be a great way to improve efficiency long term. If 3-D printing can begin to make organs that function properly this will improve the time it may take for an individual who is in need of an organ transplant. I have heard that there are huge waiting lists for some organs and being able to have an organ already made when someone needs it the most would be amazing. However, I am skeptical of some problems that may come along with 3-D printing because technology does have a tendency to malfunction and I don’t think there is much room for error when it comes to producing a “product” like an organ. I think this is a great idea. We don’t need to worry about losing things, we can just print them right up. Also, if we are in short supply, like school supplies, we can print them up as well, just like the artificial heart. It will meet and exceed the customer requirements, but the cost will be higher than normal. I believe that the benefits will outway the costs and I also believe that this is a breakthrough for science and technology that can pave the road into the near future. Having the ability to print human organs amazes me. It makes me so happy to know that innocent children will have the chance at a normal life thanks to today’s technologies. Nevertheless, a good point was brought up- how much does this process cost? Is it covered by insurance? Also, I’m curious about the accessibility of 3D printing. It seems like the next ten years will look drastically different from what we know now. This is both exciting and frightening. I totally agree that 3D printing is an awesome technology, where it could benefit a lot of people. It is really interesting how 3D printing machine can customize a human body part or an organ, such as, lungs, heart, or liver that will almost no change of a donor rejection, because the organ will be built using the patient unique DNA. On the other hand, 3D printers have the potential to put many jobs at risk as any other technology and a huge concern about 3D printers is that printer can create dangerous items such as guns and knives.